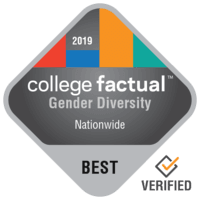 Statesboro, Georgia – College Factual has released its 2019 rankings for gender diversity. Georgia Southern University did very well in these rankings that recognize colleges for diversity in gender. The university earned this recognition due to its commitment to supporting both men and women. In particular, of all undergraduates on campus 49.3% are male and 50.7% are female. Georgia Southern University is ranked #82 out of 2,486 colleges and universities analyzed for gender diversity. This puts them in the top 5% of all schools in the country. Georgia Southern University is ranked #2 out of 69 colleges in the state of Georgia for gender diversity. This puts GaSou in the top 5% of all colleges in the state. Read more about diversity at GaSou. See the full rankings for diversity in Georgia. Georgia Southern University is located in Statesboro, Georgia in a small town setting. GaSou serves approximately 18,000 undergraduate students from across the country. The school has a student to faculty ratio of 22 to 1. GaSou is a top school for gender diversity according to @CollegeFactual. Learn more about the components of diversity at GaSou, including ethnic, gender, and age diversity. Get notified when similar news about Georgia Southern University happens.